Charles Cholmondeley of MI5 and the British naval intelligence officer Ewen Montagu could not have been more different. Cholmondeley was a dreamer seeking adventure. Montagu was an aristocratic, detail-oriented barrister. But together they were the perfect team. They created an ingenious plan: Get a corpse, equip it with secret (but false and misleading) papers concerning the invasion, then drop it off the coast of Spain where German spies would, they hoped, take the bait. The idea was approved by British intelligence officials, including Ian Fleming (creator of James Bond). Winston Churchill believed it might ring true to the Axis and help bring victory to the Allies. "Here, finally, is the complete story with its full cast of characters (not a dull one among them), pure cathnip to fans of World War II thrillers and a lot of fun for everyone else." "Brilliant and almost absurdly entertaining…The cast of characters involved in Mincemeat, as the caper was called, was extraordinary, and Macintyre tells their stories with gusto." "OPERATION MINCEMEAT is utterly, to employ a dead word, thrilling. But to call it thus is to miss the point slightly in terms of admiring it properly….What makes OPERATION MINCEMEAT so winning, in addition to Mr. Macintyre’s meticulous research and the layers of his historical understanding, is his elegant, jaunty, and very British high style." "Macintyre, whose previous book chronicled the incredible exploits of Eddie Chapman, the crook turned spy known as Zigzag, excels at this sort of twisted narrative….Great fun." "A nearly flawless true-life picaresque…zeroes in on one of the few times in war history when excessive literary imagination, instead of hobbling a clandestine enterprise, worked beyond its authors’ wildest dream….Almost inedibly rich with literary truffles—doppelgangers, obsession, transgression, self-fashioning….It is hard to oversate how cinematic this story really was." "Another true WWII tale that reads like something by Ian Fleming….the fullest account yet." "London Times writer-at-large Macintyre offers a solid and entertaining updating of WWII's best-known 'human intelligence' operation....[and] recounts [the] adventures and misadventures with panache." "[An] edge-of-your-seat history....unveiling previously classified files and even unearthing living witnesses to the grand conspiracy." "This retelling of a well-known part of World War II espionage history will appeal to military history buffs, especially those new to this particular episode, and to readers of adventure fiction, who will find it hard to put down." "A terrific book….Students of the second world war have been familiar with Mincemeat for many years, but Macintyre offers a mass of new detail, and enchanting pen portraits of the British, Spanish and German participants. His book is a rollicking read for all those who enjoy a spy story so fanciful that Ian Fleming—himself an officer in Montagu’s wartime department—would never have dared to invent it." "A chillingly good book….Macintyre has taken a well-known story of wartime deception, embellished it, and shown that it was even more ingenious and even more risky than we had all supposed." "Fascinating ... 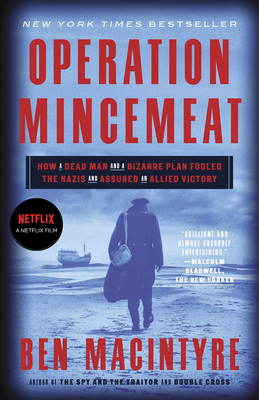 The complexities and consequences of the story that Macintyre tells in OPERATION MINCEMEAT are compelling – a tribute to his impressive abilities as a sleuth (ones that we’ve witnessed in his previous books) and to his capacities as a writer. He has the instincts of a novelist rather than a historian when it comes to elision , exposition, narrative and pace, and is depiction of character is vividly alive to nuance and idiosyncrasy. Like the best novelists, he understands that all people are fundamentally individual – odd and unique to themselves – and that stereotypes exist only in bad fiction, whether on the page or on screen." "Ben Macintyre turns up trumps in this rollicking tale of a second world war mission to dupe the Germans by using a corpse bearing fictional military plans ... The cast of characters is irresistible, and Macintyre’s enthusiasm for them richly merited ... a terrific book with exceptional photographs of everybody, including the corpse. Students of the second world war have been familiar with Mincemeat for many years, but Macintyre offers a mass of new detail, and enchanting pen portraits of the British, Spanish and German participants. His book is a rollicking read for all those who enjoy a spy story so fanciful that Ian Fleming – himself an officer in Montagu’s wartime department – would never have dared to invent it." "Macintyre has a journalist’s nose for a great story, and a novelist’s skill in its narration. If anything, Operation Mincemeat is even more spellbinding than his previous story of wartime espionage, Agent Zigzag, with a cast-list every bit as dotty and colourful ... Macintyre is a master of the thumbnail character sketch." "The Times's associate editor, Ben Macintyre, also the author of the acclaimed Agent Zigzag, is fast becoming a one-man industry in these updated tales of cunning, bravery and skulduggery. With his mix of meticulous research and a good hack's eye for narrative, it is hard to think of a better guide to keep beckoning us back to that fascinating world ... In the story of the homeless Welsh vagrant, Glyndwr Michael, whose body proved so much more worthwhile in death than in life, there is enough pathos and tragedy to remind you that you're reading real life-or-death stuff, influencing the outcome of the entire war, rather than enjoying a rollicking novel, rollicking though the book often is. There's romance, and glamour, and even the splendidly named Sir Bentley Purchase, the cheerfully black-humoured coroner of St Pancras who (illegally) colluded in the procurement of the body. It's hard not to feel, sometimes, that you are reading of impossibly distant times, when men, even dead men, were real men, rather than overgrown toddlers ... The shock is not that this all happened, but that it wasn't so very long ago." "Ben Macintyre skilfully breathes life into the diverse cast of characters involved in the plan, imaginatively fleshing out the colourful personalities on both sides ... a diverting account of a pivotal moment in history."